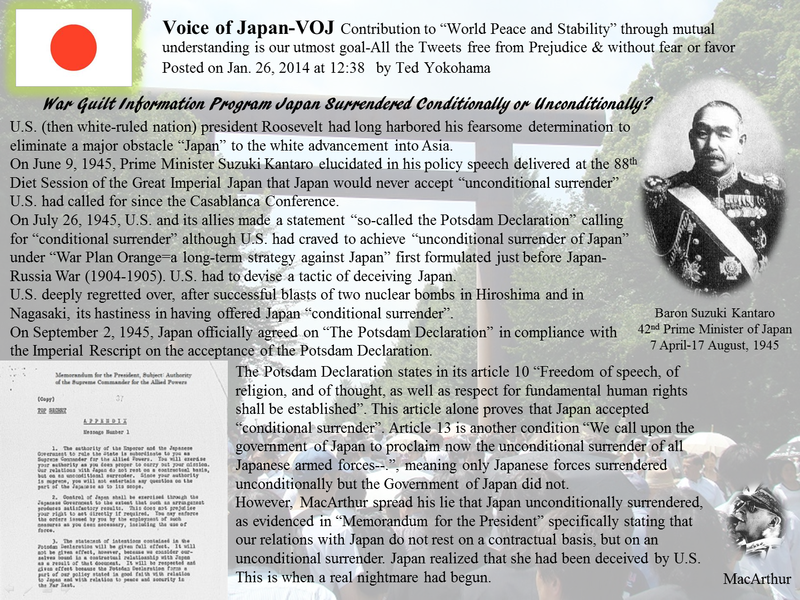 Before touching upon a title "Victor's Justice and the Current Constitution of Japan", it should be emphasized that a majority of good citizens in the free world has acquired a habitual way of thinking "Japan surrendered unconditionally to the allied powers" despite the fact that the Potsdam Declaration the Government of Japan accepted on August 15, 1945 stipulates a number of conditions such as Article 10 “Freedom of speech, of religion, and of thought, as well as respect for fundamental human rights shall be established” and "Article 13 “We call upon the government of Japan to proclaim now the unconditional surrender of all Japanese armed forces--.”, thus defining the Declaration as the final note prepared by the allied powers for the Government of Japan to decide on her "conditional surrender" while urging the Japanese armed forces to accept "unconditional surrender". General Douglas MacArthur deceitfully and contemptibly produced, possibly at his own discretion as some Japanese pundits claim, a propaganda that the Government of Japan unconditionally surrendered to U.S. and its allies as evidenced in the extras below. U.S. had long desired to champion its own manifest destiny by highlighting Japan as being an evil force to destroy Christian values, etc. and had desperately craved for Japan's unconditional submission to the then white-ruled U.S.A. , so that the victorious U.S.A. could lead the world into agreeing to consider Japan as the force hostile to the Christian dominance. 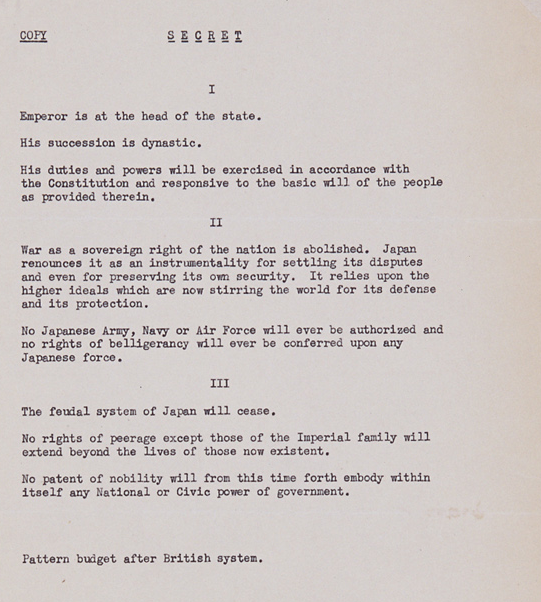 On February 3, 1946, MacArthur ordered Major General Courtney Whitney to draft the Constitution of Japan in strict compliance with "three points" outlined by himself. The above is the paper substantiating a fact that U.S. occupation forces decided to force Japan into abiding by the order of giving up "war" as her sovereign right. On February 4, 1946, Whitney ordered Colonel Charles Gettys to establish the Constitution Drafting Committee whose duty was to produce a draft within a week with a team of 25 composed of 4 lawyers not versed in the constitution at all, 3 members with some exposure to Japanese tradition and political system, military personnel, and typists. In other words, they were all laymen in the field of "constitution". On February 10, 1946, they hurriedly produced a draft constitution for its submission to MacArthur for his approval. On February 13, 1946, Whitney and Gettys visited Foreign Minister Yoshida Shigeru and handed over their draft constitution to him, in which they deleted "even for preserving its own security" possibly lest the world would denounce them for violating "Art. 43, The authority of the legitimate power having in fact passed into the hands of the occupant, the latter shall take all the measures in his power to restore, and ensure, as far as possible, public order and safety, while respecting, unless absolutely prevented, the laws in force in the country. ", the Regulations concerning the Laws and Customs of War on Land (The Hague, 18 October 1907). As soon as he glanced through the draft presented to him, Mr. Yoshida showed his facial expression looking hard and glum. 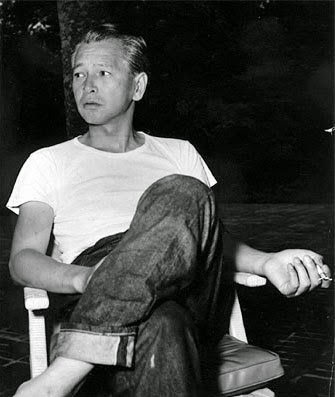 While Mr.Yoshida was scrutinizing the draft, two American visitors took out Mr. Shirasu Jiro, an aide to Mr. Yoshida and said to him "We are now taking showers of atomic energy out in the garden. 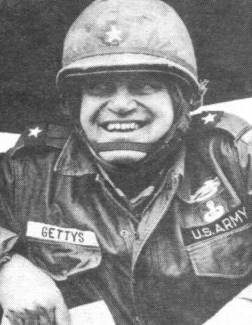 ", suggesting that U.S. is ready to execute the third nuclear attack on Japan if Japan does not accept our draft and at the same time that the Emperor of Japan will be safe if Japan accepts our draft. 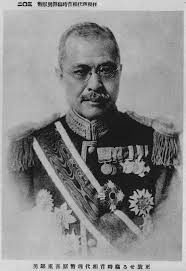 On March 6, 1946, Baron Kijuro Shiedhara, Prime Minister of Japan, had accepted the draft constitution as if it was drafted all by Japan. 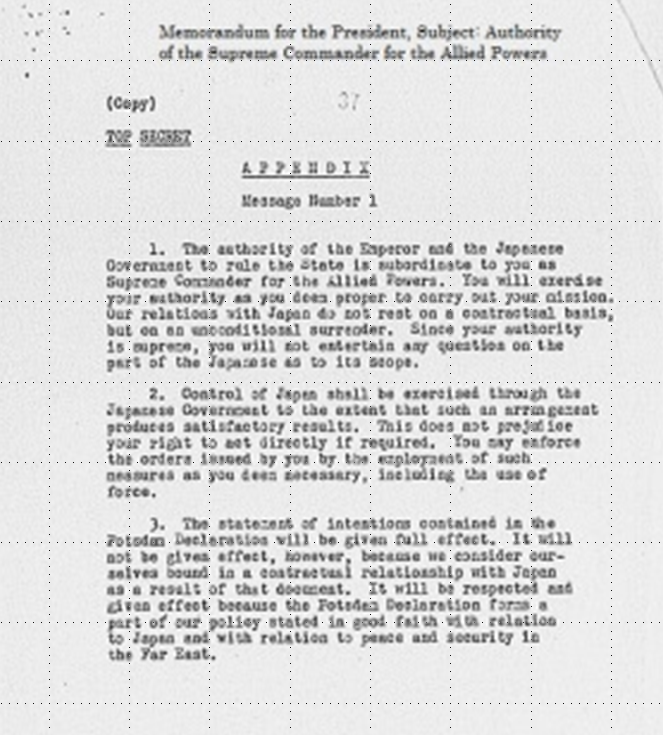 Practically no freedom had been given to Japan from the drafting process to the promulgation as the entire process had been monitored by the U.S. occupation forces, coupled with the prohibited exposure of the entire process to the public that essentially contradicts what General MacArthur publicly stated on the Current Constitution of Japan in those days. 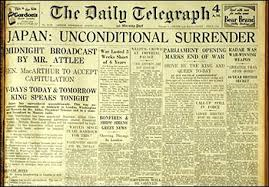 War Guilt Information Program Japan Surrendered Conditionally or Unconditionally? U.S. (then white-ruled nation) president Roosevelt had long harbored his fearsome determination to eliminate a major obstacle “Japan” to the white advancement into Asia. 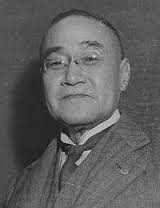 On June 9, 1945, Prime Minister Suzuki Kantaro elucidated in his policy speech delivered at the 88th Diet Session of the Great Imperial Japan that Japan would never accept “unconditional surrender” U.S. had called for since the Casablanca Conference. On July 26, 1945, U.S. and its allies made a statement “so-called the Potsdam Declaration” calling for “conditional surrender” although U.S. had craved to achieve “unconditional surrender of Japan” under “War Plan Orange=a long-term strategy against Japan” first formulated just before Japan-Russia War (1904-1905). U.S. had to devise a tactic of deceiving Japan. 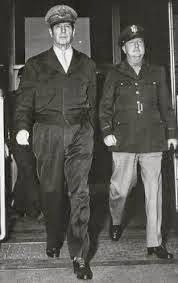 U.S. deeply regretted over, after successful blasts of two nuclear bombs in Hiroshima and in Nagasaki, its hastiness in having offered Japan “conditional surrender”. On September 2, 1945, Japan officially agreed on “The Potsdam Declaration” in compliance with the Imperial Rescript on the acceptance of the Potsdam Declaration. The Potsdam Declaration states in its article 10 “Freedom of speech, of religion, and of thought, as well as respect for fundamental human rights shall be established”. This article alone proves that Japan accepted “conditional surrender”. Article 13 is another condition “We call upon the government of Japan to proclaim now the unconditional surrender of all Japanese armed forces--.”, meaning only Japanese forces surrendered unconditionally but the Government of Japan did not. 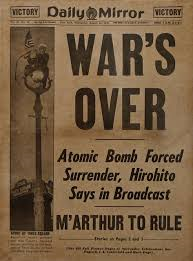 However, MacArthur spread his lie that Japan unconditionally surrendered, as evidenced in “Memorandum for the President” specifically stating that our relations with Japan do not rest on a contractual basis, but on an unconditional surrender. Japan realized that she had been deceived by U.S. This is when a real nightmare had begun. The Potsdam Declaration just threatened and demonized Japanese. It called Japanese war criminals who should be persecuted.